Following the harrowing events with the Eleven and Caleera that left Helen Sinclair alive but her ultimate location unknown at the end of Doom Coalition 4, the announcement of Big Finish’s four-set The Time War saga seemed to indicate that it would be a very long time before this dangling thread would be revisited and resolved. With the later announcement that the Ravenous series would alternate releases with The Time War and take the Eighth Doctor back to a time before that eternal conflict, the search for Helen begins in earnest as the fallout of Doom Coalition begins to fully manifest. 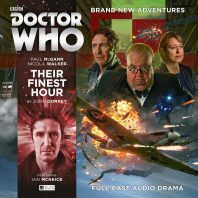 John Dorney’s ‘Their Finest Hour’ begins this new endeavour that seems set to offer slightly less interconnected tales than the previous epic sagas as the TARDIS is working on calculating Helen’s location when the Doctor receives a call from Winston Churchill in August 1940 at the start of the Battle of Britain in World War II as the fight for air superiority reaches a critical state. British targets are being thoroughly destroyed by a strange and elusive craft that would instantly shift the power of balance in the Germans’ favour were they behind it, and the British pilots report seeing only an absence in the shape of a rectangle that perhaps indicates near-complete camouflage for the devastating heat ray. The Doctor, realizing that he can use expert Polish pilots keen to prove themselves to the British after escaping from the German advance, chooses the direct option of confronting anachronism with anachronism as he intensifies planes’ shielding to withstand the mysterious heat ray, he traveling with Jan Ostowicz and Liv traveling with Wilhelm Rozycki. It’s a testament to the inherent charisma and dynamic energy of both Gyuri Sarossy and Laurence Dobiesz that Jan and Wilhelm come to life so sparklingly well, and if ever the Eighth Doctor decided to once again hold tryouts for another companion, both characters would assuredly ace the test given their determination and quick thinking on display even as they instantly find themselves out of their depth. It’s an incredibly difficult task to make supporting characters endearing and memorable in the space of one story, but ‘Their Finest Hour’ is a spectacular example of how to achieve this, making the harrowing ending with the random nature and inevitability of war all the more poignant. At the same time, the disappearance of Liv and Wilhelm without a trace following a strange second beam from the mysterious ship allows Paul McGann to show the struggle that his Doctor undergoes to comprehend the fact that he cannot always protect his companions and that the most insignificant event can prove fatal. This is an incarnation who understands just how adept he is at making up a plan of action on the fly, always a brilliant contrast to his more manipulative previous incarnation but rarely one that presents the seeming random loss that he experiences here, and McGann excels both by himself and alongside Ian McNeice’s Churchill as he brings this pain to the forefront. Of course, Liv and Wilhelm are not dead, and the occurrences regarding the mysterious and scaled Heliyon race take a fairly novel approach for a Doctor Who story that had followed a fairly traditional storyline up until their reveal. The Heliyon instantly realise that Liv knows much more about this situation that anyone on Earth should even if she herself did not develop the shield, strangely asking if they have been found by the Windward Bloc. As Wilhelm and she escape the ship in the most audacious of ways and regain contact with the Doctor after he has determined the ship is heading to central London, the Doctor requests that she return to the TARDIS and contact the Heliyon homeworld while he tries to negotiate away from a disastrous act. It almost feels like a cheat to have the TARDIS reach into the depths of space rather than allowing the Doctor to solve the problem through his own ingenuity at hand, and there is the potential that an outside force completely dictating the course of the resolution may result in a lesser emotional impact, but the truth behind the warring Helyon blocs and their means of settling their disputes is wholly satisfying and absolutely engaging enough to warrant another appearance. ‘Their Finest Hour’ may not progress the search for Helen all too much and Churchill may not feature quite as much as his prominence on the cover might suggest, but it tells a very confident and unique alien attack tale that develops its supporting cast wonderfully while making excellent use of both of its leads and slowing down the plot at crucial moments to focus on the losses that war inevitably causes no matter the scale. The resolution to the Heliyon presence is fairly unique and doused in intriguing backstory even if it takes the action out of the leads’ hands, and overall this is a strong reintroduction to the Eighth Doctor before the Time War subsumes everything that is expertly polished and flows quickly and naturally from beginning to end.